A look at the history of U-Matic video tapes needs to include some of the what-ifs in the history of video itself. It’s true the U-Matic tape was the real progenitor of the later videocassette based on how it was the first video to be placed in cassette form. Even though video had been around since the late 1950s in television production, the format was basically open reel and not easy to store. U-Matic gave a more convenient way to store video, even if they looked like oversized VHS tapes in the context of today. The development of U-Matic, though, is one that could have brought commercial VCR’s to the world much earlier than in the late 1970s and early ’80s. When first introduced in 1969 by Sony, the intention was to slowly develop U-Matic tapes and compatible VCR’s for the commercial market. It took two more years of development and agreement on a unified standard, however, before that was even considered. Had the price not been so high for the general consumer market, U-Matic might have beaten Betamax and VHS as the first method of recording over-the-air TV in the home. That would have meant consumers recording old TV broadcasts from as early as 1971 and eventually ending up on Youtube today. Rather than go bust before it started, U-Matic found some success being used in the business and education fields. Businesses used U-Matic for industrial tutorials and educational institutions used it to produce educational programs on TV. The news industry also invested in the technology. Those who grew up in the early to mid 1970s might remember seeing early use of U-Matic video by reporters in the field as a replacement for prior-used 16mm film. And in case you wondered what the ‘U’ means in U-Matic, it was the shape the tape made when wound around the video tape drum. You might be surprised at how long U-Matic lasted until it became completely obsolete. On the budget side of things, it was still used up until recently as the lowest part of the production scale for various business institutions. While TV no longer uses the format, U-Matic went through an evolution in the 1980s where tapes became smaller and the picture slightly better. 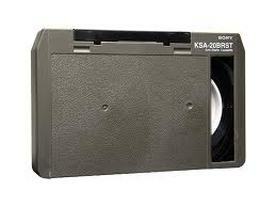 Some local TV stations would still use the tape format up through the 1980s as an extreme budget saver. For those who were fans, you can still find some of the original U-Matic players around so old tapes can be played. Most local TV stations have kept their U-Matic players so they can play U-Matic tapes back from their 1970s and 1980s archives. If you happened to own a U-Matic recorder back in the early to mid 1970s, it’s possible you have some of the earliest video footage available for general use. While it might be rare for family films to be on the format, we suspect there’s probably some out there. If you do, it’s time you preserve what’s there on a gold DVD before the video deteriorates. Here at Click-Scan-Share, we’re committed to making sure old films and videos from the old media formats of the last 80 years get transferred to digital so they’ll be preserved for generations to come. Contact us and bring in all your old film, video and slide formats so we can make sure your entire archive is restored and preserved for your grandchildren to see in perfect clarity.